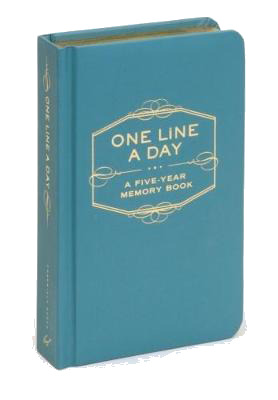 This classic memory-keeper is the perfect way to track the ups and downs of life, day by day. Each page of the journal includes an entry for five successive years, allowing users to revisit previous thoughts on a specific day of the year over the span of five years. See patterns emerge as important events like anniversaries, birthdays, and holidays come and go. As the pages fill, you’ll discover happy coincidences and have a chance to relive forgotten moments. Daunted by the idea of keeping a journal? The simple commitment of just one line a day is manageable for everyone, appealing to those new to the journaling habit and seasoned journalers alike. Durable and elegantly designed with a ribbon for easily jumping to the right page, this keepsake diary will be a treasure for years—and a great gift for generations to come. One Line a Day is the perfect present for someone starting on a new journey in life or for your own daily ritual. I'm not one to keep a diary but when I saw this little book I loved the idea and had to get one.